Standard Kit Includes - Commercial Opener & mounting hardware, 12 VDC solenoid inside 4 1/2" square poly box or installed inside closer, 12 VDC power supply, 100' 5/32" nylon tubing, two "Caution Automatic Door Signs", and air compressor adapter. ​NOTE: Opener Mounts on "Push" Side of door. 1. This unit is Field Reversible if you need to change the swing, cover will need to be prepped. 2. Standard Units can be upgraded to Heavy Duty in the field, please call for pricing. The Commercial Gentleman Door Opener may be used in the automation of swing doors for public or private access where a low energy system is applicable and low cost desirable. We also offer a power assisted option which activates the opener as the door begins to be opened manually or re-opened manually while closing. The heavy duty construction inside the Commercial Gentleman is simple yet strong! 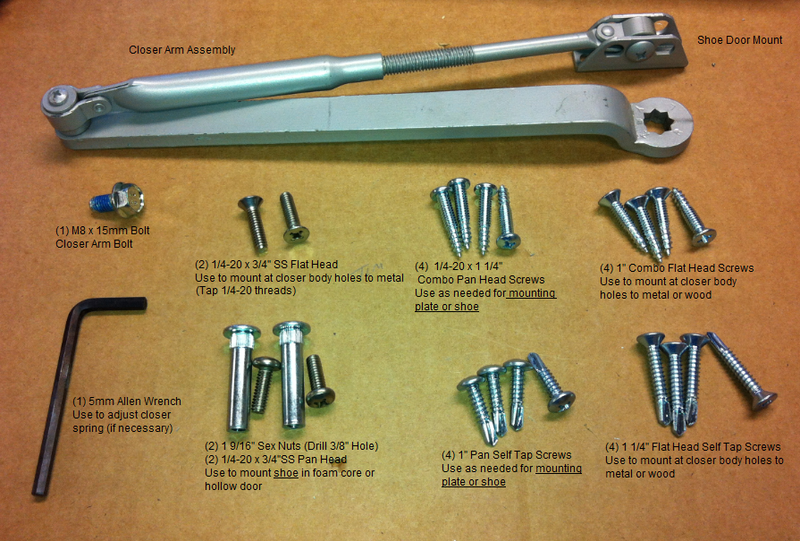 Packaged with the opener, you'll find hardware for wood or steel installations. The Commercial Door Opener can be interfaced with low voltage electronic timers and wireless activation for total public access and/or interface with existing system. Pneumatic opening operation coupled with a hydraulic closer allows for a simple reliable operator! You will need a source of compressed air to operate the Commercial Gentleman. Common installations locate the air compressor in an utility room, garage, or basement up to 125 feet away.